When I was a young girl I can remember living in an old house in Fenny Stratford called Rhondda House. The house is no longer at Rhondda Close it was knocked down. A number of bungalow’s were built where the house and grounds were. I have some small old black and white photographs taken by my father. Rhondda House was converted into flats.It housed 2 families.We lived at number 2,at the top of the house. It did not have central hearing we had open fires in the bedroom that I shared with my brothers. The house had big grounds ,it once had a grass tennis court ,I can remember the nets .The house entrance was a gravel drive I can remember there was a large tree at the front of the house. There were some plum trees in the garden. There was a large garage where an old black car was stored I am not sure who it belonged to. In the garage there were some steps and a room which to me stored the treasure and a horse saddle .The treasure was in a big container which would have been a trunk. I did take some of the small articles to show my mother, she told me they had to be returned. We had great fun as children, as we got older some of the children would come and play and bring their bikes we had big bonfires on Bonfire night. I can remember our birthday parties at the house, my parents had a long table they had bought in 1951 from the ideal home exhibition (we would get tickets for the exhibition because my father worked in the print in London).The table would be extended with an extra piece of wood to accommodate all the children. At the top of Rhondda Close some police houses were built. I can remember the Surname Smith. We would play and also go to parties at that house. At the bottom of the close was a green it still remains. My older brother was friends with a boy who lived next to the green. The surname was Bradshaw, the father was headmaster of Leon County Secondary School. My younger brother was born at Rhondda House. He does not remember as much about the house as I do. One of the families who lived at the front flat had a black grand piano. The man who lived there at that time drove a coach. 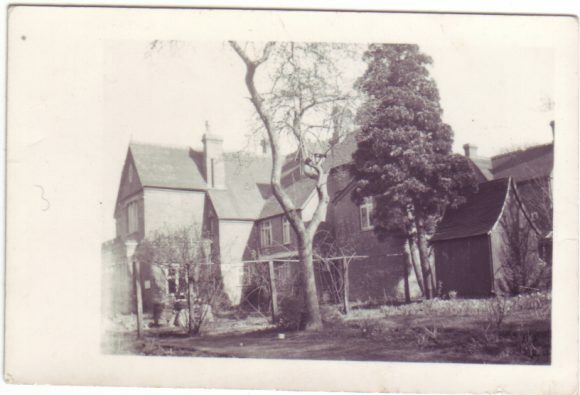 Another family who lived at the back had a son who went onto Bletchley Grammer School . You could hear the noise from the timber yard adjacent to the house. 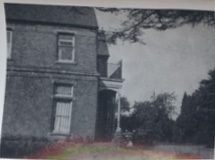 I have found out from reading books from the library and the internet some of the previous occupants of Rhondda House. The Rowland Family started the Timber Merchants in 1847.They sold the business in 1942 to Latham & Company. Thomas Evans Rowland had lived at Rhondda House his brother William Richard Rowland lived at Ropley House . I lived in one of the Rhondda Close Police Houses in the mid 1950s – the one on the end closest to the House. The police officer you remember was Alan Smith, one of the other police families was the Morgans, and yet another was the Watkins. We always played in the house’s beautiful grounds and I remember one of the boys who may well have been your brother – Peter? – who we built a tree house with. I remember going into one of the flats in Rhondda House and was very envious of it as it seemed so spacious! My mum was billeted at Rhonda house in 1942 when she worked at Bletchley park during the war. She was in the Intelligence corps.